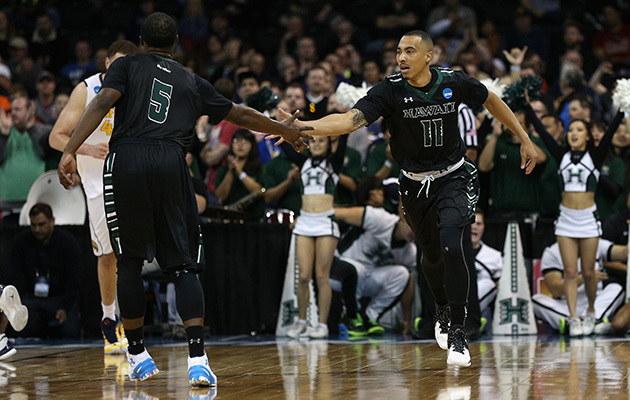 The Hawaii Rainbow Warriors upset the California Golden Bears to advance to the second round of the NCAA tournament. Hawaii won't go to the NCAA tournament next season because of NCAA sanctions, so the Rainbow Warriors are planning on sticking around this year's Big Dance as long as possible. Hawaii, the No. 13 seed in the South Regional, led for the final 32 minutes on Friday to upset No. 4 seed California, 77–66. The Bears knew they would be without point guard Tyrone Wallace, who broke his hand this week, but before the game they also learned they'd be without fellow guard Jabari Bird, who suffered back spasms before the game. With star freshman forward Jaylen Brown limited to four points on 1-for-6 shooting, Cal had difficulty keeping pace with the Warriors. Hawaii got 19 points from senior guard Quincy Smith and shot 51.9% overall. After the Bears closed within 47–46 on a Kameron Rooks three-point play with 11:56 to go, the Warriors responded with four quick points to push the margin to five. Hawaii was never threatened again. The Warriors tied for first in the Big West conference this season before winning the conference tournament, so they entered the tournament as a popular upset pick. The first NCAA tournament win in school history was also the biggest upset so far in the 2016 NCAA tournament. On Thursday, two No. 12 seeds (Arkansas-Little Rock and Yale) pulled upsets but Hawaii is the first No. 13 seed to win in the NCAAs since La Salle beat Kansas State in 2013. The Warriors will face the winner of the game between No. 5 Maryland and No. 12 South Dakota State on Sunday in Spokane.